The United Kingdom is holding early parliamentary elections on Thursday called by the country's Prime Minister Theresa May to overcome "division in Westminster" ahead of the upcoming Brexit negotiations. MOSCOW (Sputnik) – The United Kingdom is a constitutional monarchy with a parliamentary system of governance. The monarch is Queen Elizabeth II. The parliament is the supreme legislative body in the United Kingdom, British Crown dependencies and British overseas territories. The parliament is bicameral, consisting of an upper house, dubbed the House of Lords, and a lower house, or the House of Commons. All members of the House of Lords are appointed, whereas the House of Commons, consisting of 650 members, is an elected body. The majority of issues pertaining to parliamentary elections are regulated by the 1983 Representation of the People Act, with amendments and additions made in 1985 and 2000. The election date is set by the prime minister. The 2011 Fixed-term Parliaments Act fixed parliamentary terms at five years, which means that the prime minister can call new elections any time within this period but no later than the five-year deadline. Traditionally, the prime minister is required to ask the monarch to dissolve the parliament. The Queen issues a Royal Proclamation, which stipulates the dates for the dissolution of the parliament, new elections and the Queen’s Speech. Neither House can proceed to public business until the Queen’s Speech has been read. Starting from 1924, parliamentary elections were usually held within 17 days (excluding weekends and bank holidays) of the Royal Proclamation. Under the 2011 act, the parliament is to be dissolved 25 working days before general elections. The nomination of candidates begins the next day after the publication of the election notice. All candidates must be above 18 years of age and possess citizenship of the United Kingdom, any Commonwealth country, or Ireland. The majority of candidates represent political parties. To become a validly nominated candidate, they need to submit a completed set of nomination forms along with a deposit of 500 pounds (approximately $645). The deposit is refunded if the candidate wins 5 percent or more of the votes cast. The number of constituencies and hence the number of MPs are revised once every eight to 12 years. At present, Britain is divided into 650 constituencies, including 533 in England, 59 in Scotland, 40 in Wales and 18 in Northern Ireland. Constituencies are divided into voting areas with polling stations. The authority to establish voting areas and polling stations rests with local councils. Voters must be registered to vote to take part in the elections. The methods of voting include voting in person, voting by post and voting by proxy. 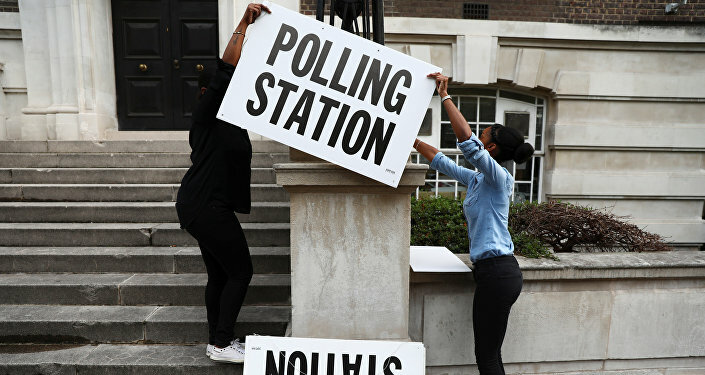 Members of the House of Lords, EU citizens residing in the United Kingdom, convicted people detained in pursuance of their sentences and anyone found guilty of corrupt or illegal practices in connection with an election within the previous five years, cannot vote in a UK Parliament election. UK citizens living abroad can apply to be an overseas voter and can vote by post or by proxy, provided they have been registered to vote in the country in the last 15 years. There are no voting limitations for the queen. However, it is viewed as unconstitutional for the queen to vote in any election because she has to remain politically neutral. Since 1935, general elections have been held on Thursdays with polling stations open from 7 a.m. [6:00 GMT] to 10 p.m. local time. In the case of public unrest involving the use of force, voting can be postponed until the next day. Only voters, the chair of the constituency and their assistants, as well as candidates and their authorized representatives, can be present at the polling station on voting day. Election results are determined on the basis of the majority-vote system. The law does not stipulate any turnout or minimum threshold requirements. The seat in Parliament goes to the candidate who receives the most votes compared to other candidates. The first election results can be announced at 11 p.m. local time on the voting day, but the majority of constituencies only announce them at 3 a.m. or 4 a.m. local time Friday. After voting results have been submitted by all constituencies and it becomes clear which party has won the absolute majority of seats in the House of Commons, the prime minister makes a statement on the election results. If the ruling party wins, the cabinet is considered to be automatically reelected and continues working without waiting for its powers to be confirmed. If not, the prime minister must leave office and tender his/her resignation as prime minister to the Queen.